If you think a 6-day vacation in Ireland without the typical crowds and high-season prices costs a pot of gold, think again. Travel through Ireland’s rugged landscapes and welcoming locales during the off season and see your luck change! From Limerick to Dublin, you’ll experience the beauty and charm of the Emerald Isle. 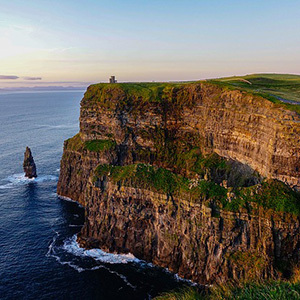 Take an excursion from Limerick to the spectacular Cliffs of Moher. Explore the buzzing harbor city of Galway, and be amazed at the 100-mile panoramic drive on the Ring of Kerry. From the town of Killarney, travel to Blarney and get a chance to kiss The Stone of Eloquence. Enjoy free time in the picturesque fishing-port town of Kinsale. Take in the old-world charm of Kilkenny, then continue to Dublin’s “Fair City” for an orientation drive to see O’Connell Street’s statues, red-brick townhouses of the Georgian squares, Trinity College, and St. Patrick’s Cathedral. Find the luck of the Irish on an off-season escape and guided tour of Ireland. On the Shannon River in southwest Ireland, Limerick is noted for its fine laces.